The Chrysler Group announced pricing for the 2014 Jeep Cherokee and in a surprising turn of events – the funky new Cherokee carries an entry price that is actually lower than the price of the Jeep Liberty which it effectively replaces with a base price of just $22,995 plus destination. While the folks at the Chrysler Group haven’t offered up detailing pricing for the 2014 Jeep Cherokee, today’s announcement brought us our first idea of how much buyers of the new midsized SUV will pay to put one in their driveway. The 2014 Cherokee will be offered in four different trimlines – Sport, Latitude, Limited and Trailhawk with the first three offered in either 4x2 or 4x4 configurations. The Cherokee Trailhawk comes with standard four wheel drive. All of the trimlines call upon the 2.4L MultiAir2 Tigershark 4 cylinder engine that sends 184 horsepower and 171lb-ft of torque to the wheels via a segment exclusive 9-speed automatic transmission that should help the two wheel drive Cherokee achieve fuel economy measures up over 30mpg. It should be noted that none of the prices discussed here include the $995 destination fee so buyers can expect to pay at least a grand more than the numbers below when they get to the dealership. First up is the 2014 Jeep Cherokee Sport 4x2 which carries a price of $22,995 - $400 lower than the Liberty Sport 4x2 that it replaces. Adding the Jeep Active Drive I 4x4 system adds $2,000 to the price for a total of $24,995 for the Cherokee Sport 4x4 and that is also $400 less than a similarly equipped Liberty. The Cherokee Sport is a base model only in name with a long list of impressive amenities that includes (but is most certainly not limited to) Uconnect 5.0-inch touchscreen media center featuring Bluetooth hands-free phone control and a streaming audio capability, a new 3.5 inch thin-film transistor (TFT) LED driver information display in the gauge cluster, power windows with driver one touch controls, 10 air bags, LED tail lamps, daytime running lamps, halogen projection headlamps, four-wheel anti-lock disc brakes, electronic stability control, traction control, Hill-start Assist, electric power steering, electric park brake, cruise control, air conditioning with rear outlets, remote keyless entry, power remote open fuel door, a tire pressure monitoring system with four tire display and much, much more. Next in line is the 2014 Jeep Cherokee Latitude 4x2 which carries a base price of $24,495 while the Latitude 4x4 starts at $26,495. This package includes all of the features of the Sport models and adds things like body color power mirrors and door handles, tinted rear side glass, fog lamps, power windows with one-touch controls all around, front passenger fold-flat seat with in-seat storage space, a leather-wrapped steering wheel, ambient LED interior lighting, unique 17 inch aluminum wheels, air conditioning with integrated center stack controls and more. 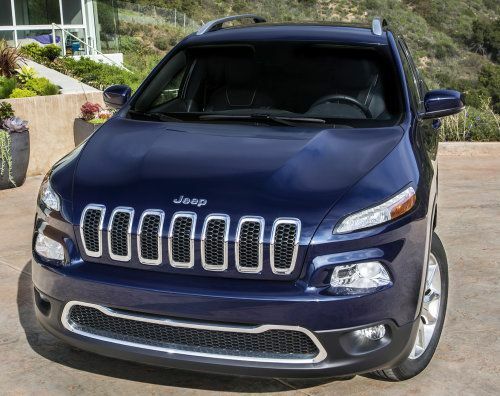 The 2014 Jeep Cherokee Limited (shown above in blue) follows in the tradition of other Limited trimline Jeeps, adding a long list of conveniences to offer a far more engaging driving experience. The Cherokee Limited 4x2 starts at $27,995 while the Limited 4x4 has a base price before any options of $29,995. In addition to all of the features of the Cherokee Latitude, the Limited package adds leather heated/power seats, a heated steering wheel, Keyless Enter-N-Go, automatic headlamps, heated exterior mirrors, unique bright lower fascia appliqués front and rear, a security alarm, unique 18-inch polished/painted aluminum wheels with all-season tires, 8-way power driver seat with 4-way power driver lumbar adjust, an adjustable 7 inch thin film transistor, an 8.4 inch touchscreen infotainment system, SiriusXM Radio, a ParkView rear backup camera system, remote start, dual-zone automatic temperature control, auto-dim rearview mirror, universal garage door opener, a leather-wrapped shift knob and more. Finally, the top of the line package is the 2014 Jeep Cherokee Trailhawk (shown above in red) which comes with standard four wheel drive and a price of $29,495. Like the Limited, the Trailhawk package is based on the Cherokee Latitude but a long list of features have been added to make this one awesome offroading machine. In addition to the standard Jeep Active Drive Lock 4x4 system with low range and locking rear axle, the Cherokee Trailhawk adds unique offroad front and rear fascias, offroad wheel flares, red tow hooks, skid plates, an offroad suspension package with a lower ride height, heavy duty engine cooling, an auxiliary transmission oil cooler, the Selec-Terrain drive mode selector, new Selec-Speed Control with Hill-ascent Control and Hill-descent Control, heated/power exterior mirrors, accent color mirrors, unique grille surrounds, lower fascia appliqués and roof rails, unique “Trail Rated” and “Trailhawk” badges, package specific 17 inch polished aluminum wheels with black painted pockets and OWL all-terrain tires, a full-size spare tire, unique cloth and leather interior, red accent stitching throughout the cabin, a leather wrapped shift knob, a 7 inch thin film transistor reconfigurable instrument cluster, an 8.4 inch touchscreen infotainment system a cargo net and all-weather slush floor mats. Options vary based on the package chosen but the Latitude, Limited and Trailhawk versions of the 2014 Jeep Cherokee can be equipped with the new 3.2L Pentastar V6 that delivers 271 horsepower and 239lb-ft of torque. Other optional items across the different trimlines of the new Cherokee include things like a 506 watt Alpine premium audio with nine speakers and a subwoofer, the gorgeous CommandView dual-pane panoramic sunroof with power sunshade, an engine block heater, the Cold Weather Group, the Comfort/Convenience Group and the Trailer-tow Group. Unfortunately, no pricing is available yet for any of the optional items but with the new Cherokee expected to hit dealerships later this year – it shouldn’t be long before we know exactly how much the new Jeep midsized SUV will cost with our ideal options. Stay tuned.